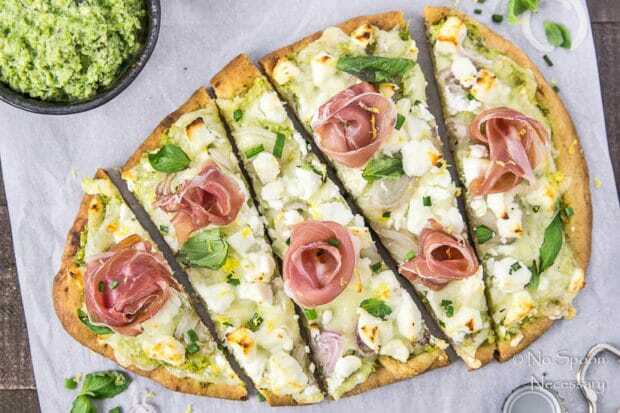 These quick and easy Naan pizzas are smothered with asparagus pesto and topped with decadent goat cheese, oozy fontina, meaty prosciutto and fresh herbs. 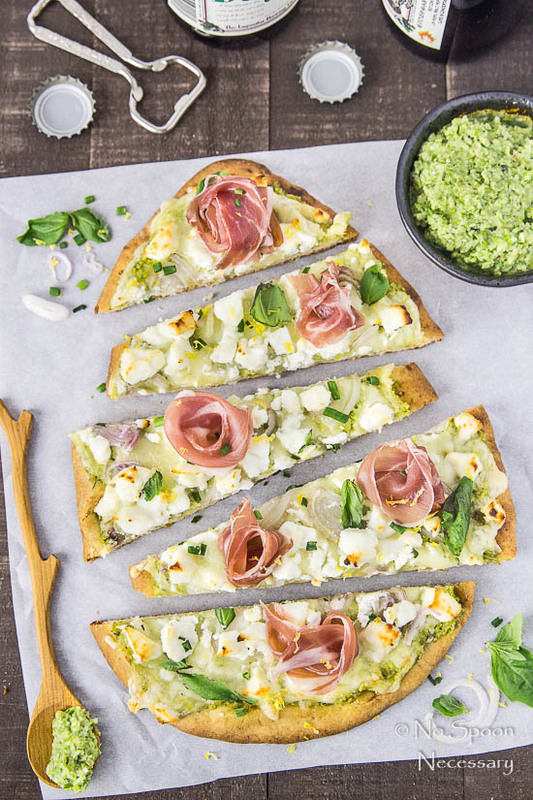 Spring inspired and downright delicious, these pretty pizzas are sure to please! What’s happening friends! How was your Easter weekend? I hope it was filled with lots of love and laughter. And delicious food. And possibly a Mimosa or Bloody Mary or two (<– only if you are of legal drinking age of course). Did the Easter Bunny bring you anything in his basket? Or maybe you got some money in a few eggs? Anyways, I have another question for you guys. Are you a thin, pan, or hand-tossed crust pizza type of person? I am an über thin crust kind of girl, through and through… until it comes to naan pizzas. 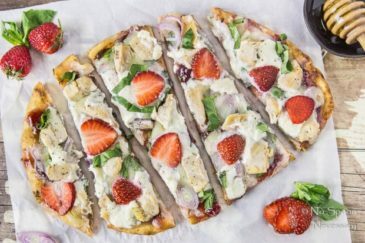 Naan bread used as a pizza crust is my jam, and I recently realized that I have never shared a naan pizza on this here site. And that I have only shared two pizza recipes to date. Insanity, right?! No worries, because I am fixing both those things today. Lucky for you guys I share the wealth of all things delicious. For free. Hmmm… That totally makes me a do good-er, right? Sorry, I digress. 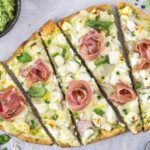 Back to these pizzas – they are creamy, cheesy, meaty, a smidgen salty, nutty, herbaceous, a touch garlicky and perfectly savory. 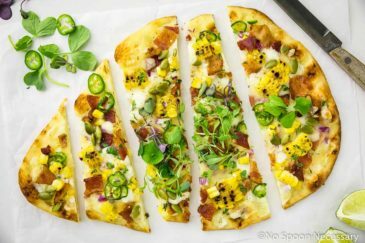 All the contrasting warm and cold toppings piled onto a crispy, fluffy, carb-a-licious naan bread makes for one seriously scrumptious pizza. 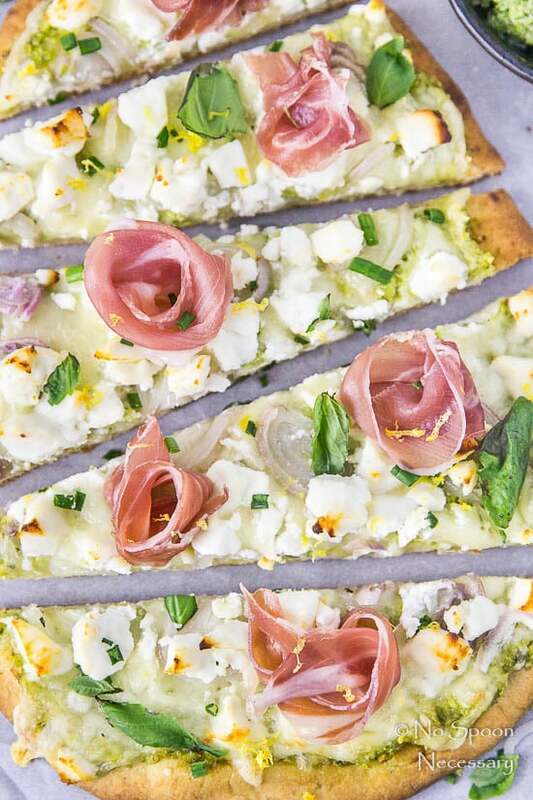 Trust and believe, you need this palatial pizza in your life. 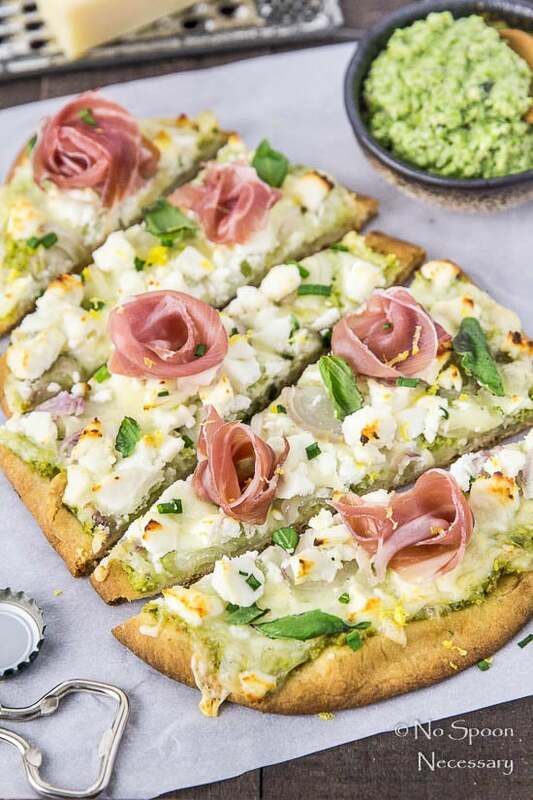 But, not only is this pizza on point in the taste department, it is also a breeze to throw together since you aren’t making your own dough. 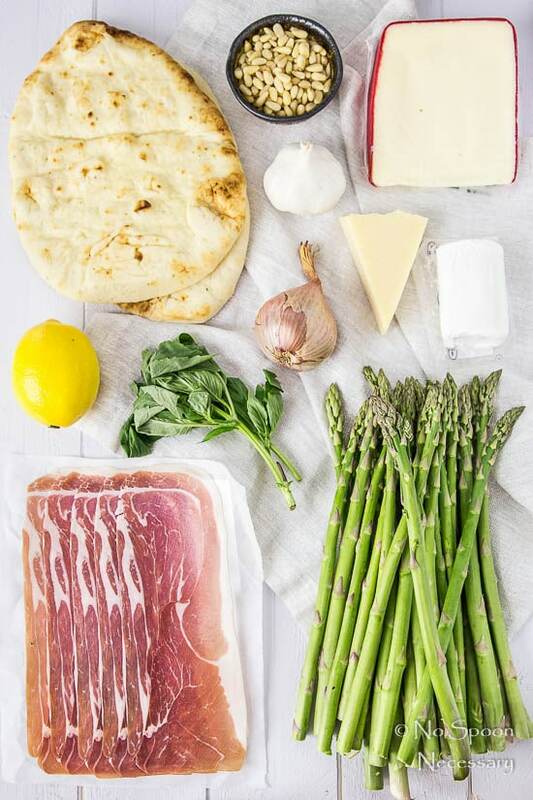 Use a food processor to whip together some asparagus pesto, slather it on some naan, top with cheese, garlic and shallots; bake, top with prosciutto and fresh herbs; and devour. Wham, bam, thank you ma’am. Pizza heaven you are mine. 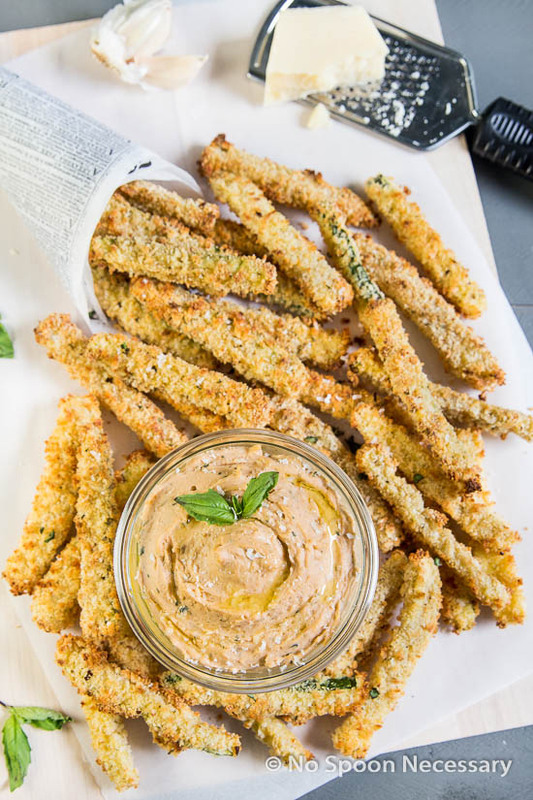 If raw asparagus pesto freaks you out, which it shouldn’t because you are baking the pizza, you can absolutely make roasted asparagus pesto. I don’t judge… or I’ll try not to. 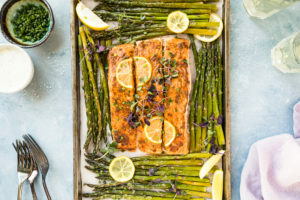 😉 Simply roast the asparagus on a sheet pan in a 400 degree F. oven for 10-15 minutes and allow it to cool for 5 minutes before proceeding with the instructions as directed. If you want to make prosciutto roses like you see here, simply take a small slice of prosciutto and wrap it around your finger. Voila. 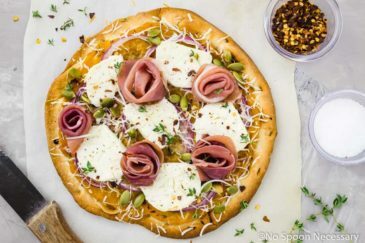 Prosciutto roses. 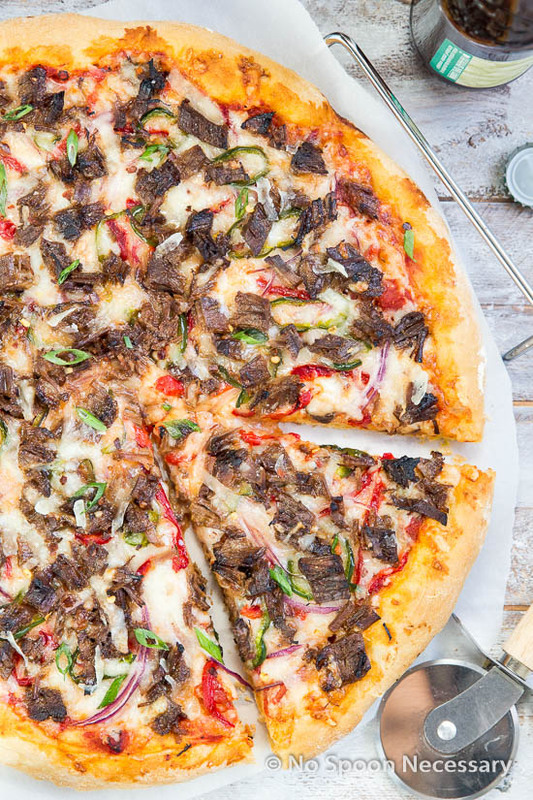 Balsamic vinegar drizzled on this pizza before serving is delicious. I didn’t do so in these pictures because I’m all about the pretty, and brownish vinegar drizzled on top does not a pretty picture make. But if you aren’t taking pictures, you should try this pizza with some balsamic. SO Good! 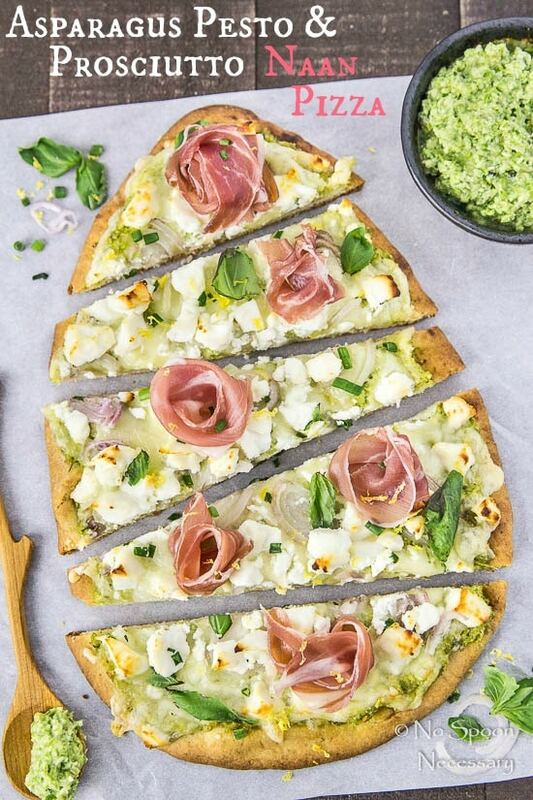 Add these quick and easy naan pizzas to your dinner rotation. I promise you are going to love them! Until next time friends, Cheers – to exquisite pizza. Preheat oven to 400 degrees F. Line a baking sheet with aluminum foil and spray with nonstick cooking spray. 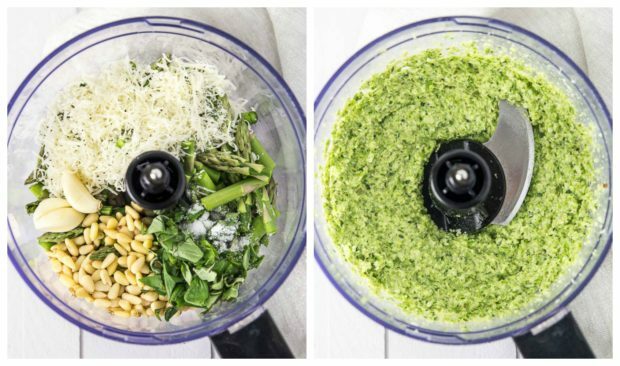 For the Asparagus Pesto: To the bowl of a food processor add: asparagus, garlic, pine nuts, basil, parmesan, lemon juice and ½ tsp salt. Pulse until combined. Add in asparagus and process until a paste forms, stopping to scrape down the sides as necessary. Slowly drizzle in the remaining 3 tablespoons of olive oil and process until just combined. Taste and adjust for seasoning. 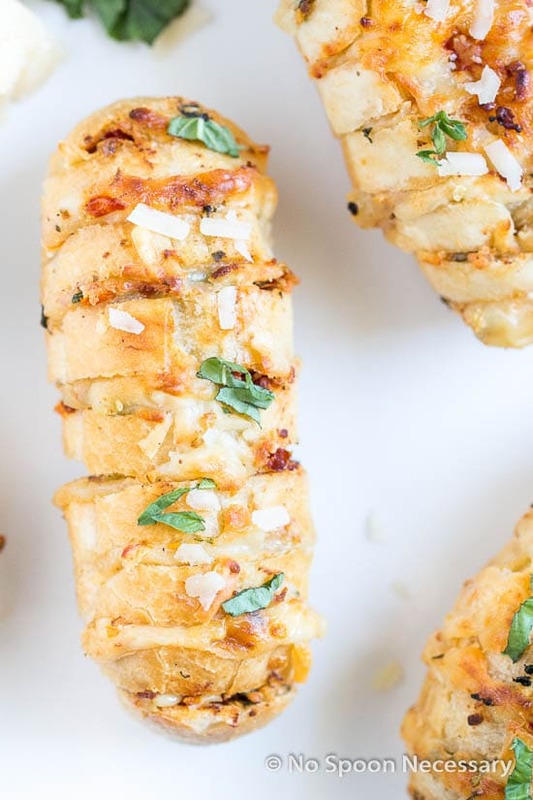 *With the motor running, slowly add in more olive oil, 1 tablespoon at a time, if a thinner consistency is desired. For the Pizza: Place naan on baking sheet. Spread a heaping ¼ cup of asparagus pesto onto each piece of Naan. Top with shallots, garlic, fontina and goat cheese. Bake for 13-15 minutes or until golden brown. 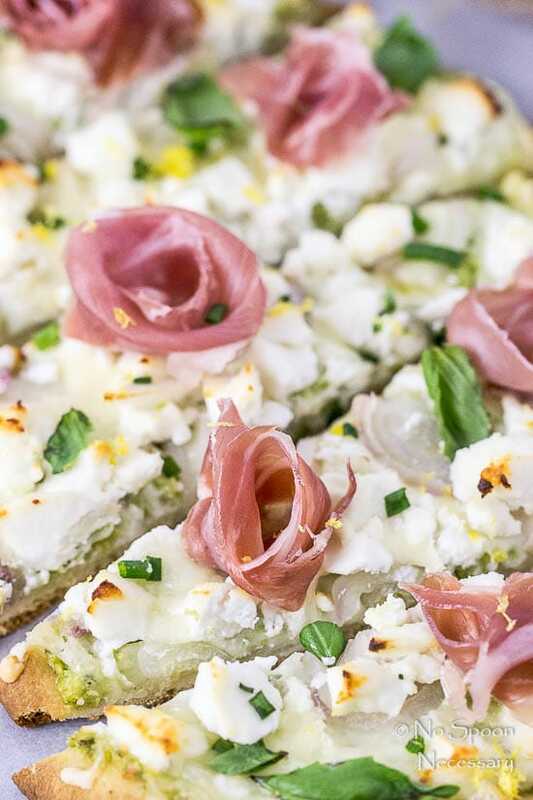 Remove from oven and top with prosciutto, basil, chives and lemon zest. Serve immediately. *For Roasted Asparagus Pesto: Line baking sheet with aluminum foil and spray with non-stick cooking spray. 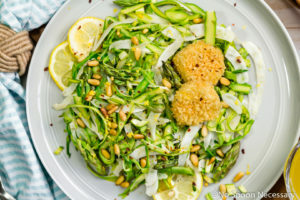 In a large bowl toss asparagus with 1 tablespoon olive oil. Season generously with salt and pepper. 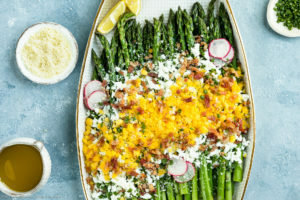 Transfer asparagus to prepared baking sheet in a single layer. Roast for 10-15 minutes, until tender. Remove from oven and let cool for 5 minutes. 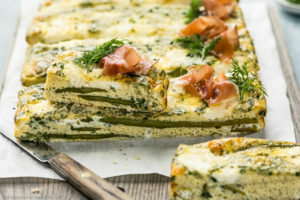 *Asparagus pesto will keep, covered, in the refrigerator for up to 2 days. 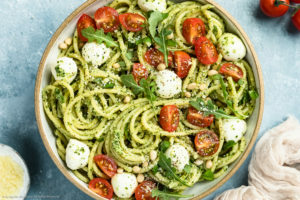 Pesto is great as a sauce for pasta! So glad you had a nice Easter! Ours was low key and dinner at my mom’s house. And this pizza is all kinds of amazing! 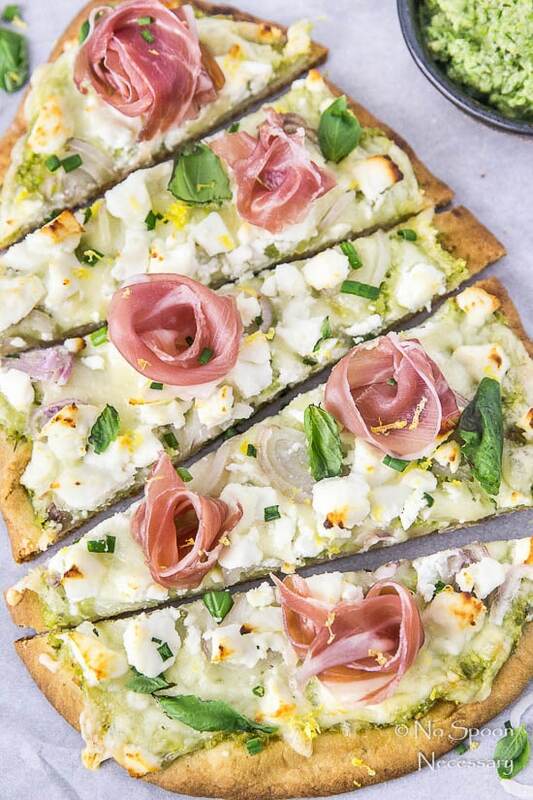 Love the prosciutto roses and asparagus pesto! 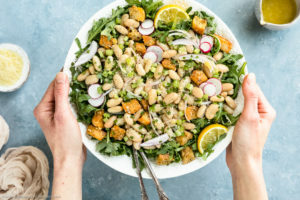 Looks so fresh and delicious! So our Easter was pretty much like yours with one difference. We didn’t have rain – instead we got the ice rain which made us stay at home as well. And this is a totally delicious pizza, Chey (or I would say Naan bread pretending to be a pizza). Sure you should fix such a gap and make MORE pizzas soon. There are SO many things going on here that I’m just in love with! 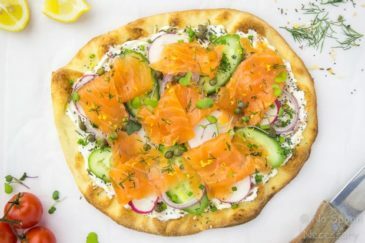 I’m a thin curst girl all the way, but I LOVE naan pizza! 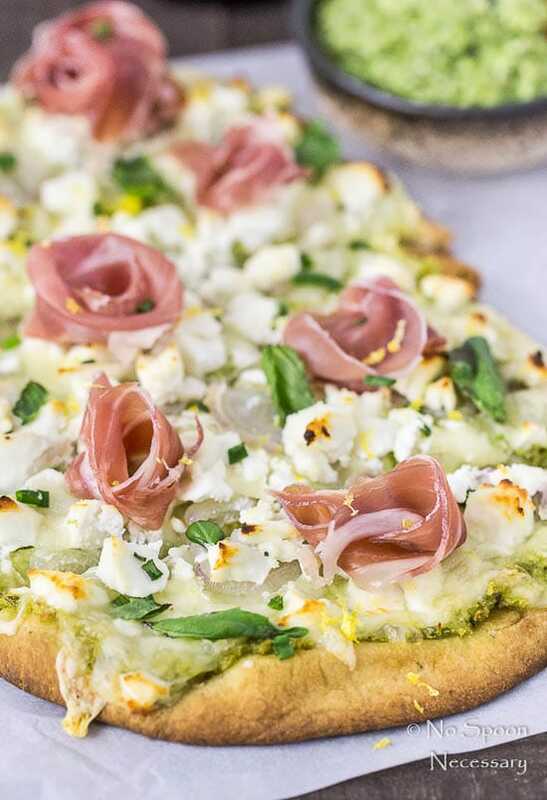 The asparagus pesto is perfection, the prosciutto roses are absolutely lovely, and the super cute egg shape of the pizza… this is spring all the way! Pinned of course!